Mango Tomato Thokku is made with Mango, Tomato jaggery and chilli powder. 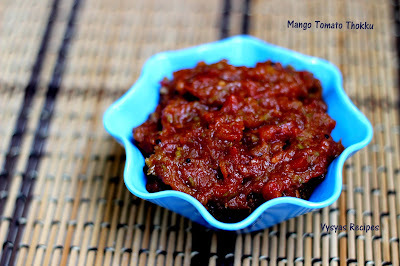 Tangy taste of Mango when blended with tomatoes and jaggery tastes awesome. This thokku goes very well with Chapathi,roti, idli, dosa and also a spread as bread.It also goes very well with curd rice.This recipe was taught by may aunt.In my home everyone loved it. This thokku can be made in jiffy.Bachelors and office goers can try this recipe at busy mornings for multiple purpose. Cook Time : 12 - 15 minutes. Mango (grated) - 1/2 cup. Chilli powder - 2 tsp. Chop the tomatoes finely and keep it aside. Heat the oil, add mustard seeds when it splutters add hing, then add tomatoes. 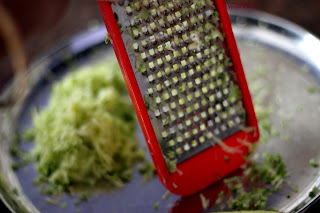 Then add grated mango saute till it is well cooked.Mangoes takes few minutes to cook. Then add jaggery, saute for 1 -2 minutes, till jaggery melts. Finally add chilli powder and salt. Saute for few minutes till it comes in the form of thokku. Normally I prefer banglore tomatoes & Parrot beak Mangoes(kili Mooku Mangai) for it. If you want the thokku hot, reduce the quantity of jaggery. Adjust chilli powder according to spice level. This thokku goes well with idli, dosa,chapathi,roti. This goes especially very well with curd Rice. you can also have it as a spread inside bread.